David John Munrow, in his brief career, was one of the most exciting and influential leaders of the British early music movement. After he completed his school education, he taught for a year in South America. He returned to England to attend Pembroke College, Cambridge, where he read for a degree in English from 1961 to 1964. He was an avid and talented flute player and while at Cambridge founded an organization to play early music. After he graduated, he studied 17th century music at Birmingham University. It was his exposure to South American indigenous music, with its strong use of wooden instruments of the flute family, that stimulated his interest in such instruments, including the recorder. At that time, interest in England in early music was growing. Munrow found himself in great demand as a recorder player. In 1967, he founded the Early Music Consort of London, with counter tenor James Bowman, violist Oliver Brookes, lutenist James Tyler, and harpsichordist Christopher Hogwood. They gave their first performance at Louvain the same year, making a London debut in 1968. Also in 1967, he became a lecturer in early music at Leicester University. 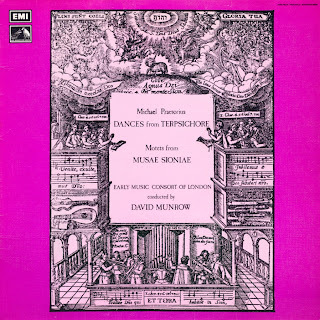 Munrow's consort shook up the regular concert world and the growing early music establishment with its performing style. Their approach was entertaining, attractive, and exuberant, even brash, without traducing the boundaries of what was known to be authentic. Suddenly, "authentic" performances were no longer scholarly affairs of main interest to academics, but popular concert events eagerly attended by the general classical music audience. The Consort appeared on television and in an intriguing development, the group also kept an interest in contemporary music. Therefore, several living composers wrote new music -- often in the most advanced musical style -- for these old-style instruments. These included Peter Dickinson (Translations, 1971), Elisabeth Lutyens (The Tears of Night, 1972), and Peter Maxwell Davies, who used the group as the on-stage band during his opera Taverner (1972), which is about a medieval English composer. In 1969, Munrow became a teacher of the recorder at London's Royal Academy of Music. In 1971, he started making lecture appearances on BBC radio. His show, "Pied Piper," was aimed at young listeners and had a listenership among all ages. For reasons that remain obscure, he took his own life in 1976. Had he not, he surely would have been recognized as one of the most influential musicians of the last half of the 20th century.